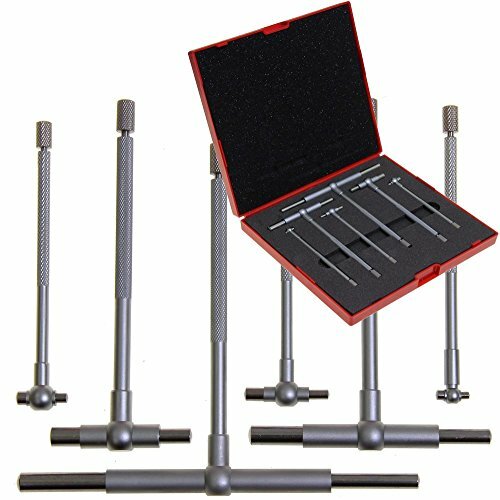 Bore gauges are types of transfer or measuring devices that are typically used for the accurate measurement of holes (Source). These precision tools can require some calibration to get them working effectively, but can be essential to keep around in your toolkit in the event you need them for a specific task. 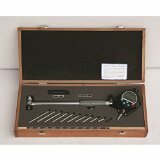 ​Dial or bore gauge directly calculates a bore. The gauge provides 3 symmetrical anvils which stick out from your gauge's body which are attached to the dial or micrometer device. When the handle is turned it shifts the anvils in or out with regard to the measurements. The knob normally has a slipping device to go ahead and take the feel out of the unit and improve consistency between assessments. The provided measurement is the average diameter of the 3 anvils, and it is generally accurate to .001 mm (Source). This gauge measures 15 x 7.5 x 2.2 inches and weighs about 2.3 pounds. Its measurement range is between 7.878 and 8.27 inches and it has an accuracy of +/-0.00006 inches. Buyers say that overall it's a decent set- though not ideal for for precision work on modern vehicle engines. While it's not as smooth as some users would like, it's sufficient for deeper bores with .001 inch tolerance. The overall consensus is that with a bit more manufacturer effort, it could be a better quality tool. For example, the storage plastic container is a bit low-quality. 6 Pieces range: 5/16" - 6". Smooth adjustment, spring loaded with knurled locking knob and knurled holding area. Moreover, it has a measuring depth of 3.15 inches and a resolution of 0.00001 inches. 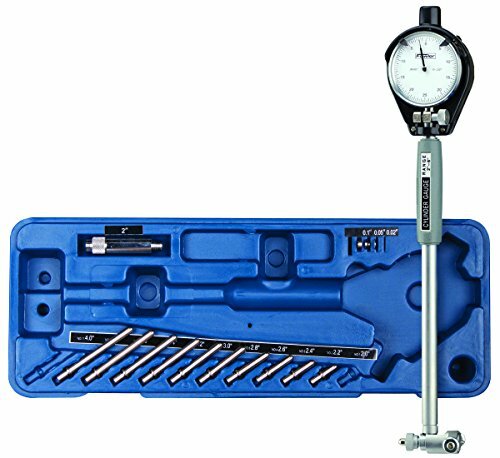 For rapid measuring, it uses Bower’s FastFit measuring heads with constant spring pressure for repeatability. It is a versatile tool with a three-point contact system for detecting triangular form error. It also has ceramic contact points for stability and durability when it comes to thermal expansion. To use this tool, it has to be connected to a Sylvac or multiplexer display unit. Users have reported receiving incomplete kits, complain that the instructions aren’t in English, and should only be used if you need less than .001 tolerances. It measures 12 x 6 x 4 inches- but definitely isn’t recommended. Not a recommended purchase for the aforementioned reasons. 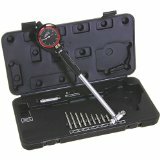 This dial bore gauge works well for measuring bores up to 10 inches deep with a range of 2 to 6 inches in diameter. It has a precision graduation of 0.0005 inches and includes interchange contact points. Moreover, the dial indicator of this tool contains jeweled bearings. It also comes with an ABS storage case to keep the tools in order. With this tool, you can easily measure tapers of cylinders and out-of-round conditions without removing pistons. 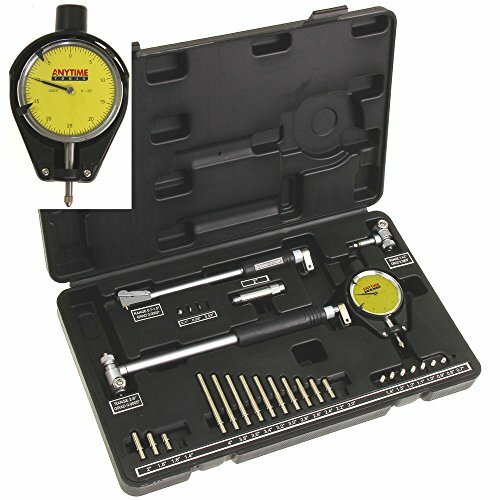 This gauge has an ergonomic design enhanced by its non-slip insulating grip and carbide contacts for longevity. All its anvils are laser-marked for ease in selection. With an overall dimension of 15.6 x 5.4 x 5.5 inches, this easy-to-use tool makes a great addition to your bore gauge kit. According to its technical specs: it has a repeatability of 0.0001 and accuracy rate of 0.0005. When you buy this item, you also get a sturdy aluminum case for the tool and its accessories. 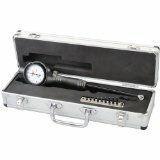 This gauge reports a range between 2 and 6 inches, with a bore depth of 6 inches and precision graduation of 0.0005 inches. It comes with a gauge with interchangeable contact points. Moreover, its dial has jeweled bearings. It is helpful in measuring tapers of cylinders and the like without removing the pistons. This tool is easily adjustable with fast and easy metric conversion. When you buy it, you also get a free ABS storage case to keep the tool and its accessories in one convenient place. One user writes of having sold his first bore gauge but then having to repurchase another model because he bought a new car and needed to measure its cylinders. He also comments that with some fine-tuning you will be able to configure it from calipers or a micrometer. 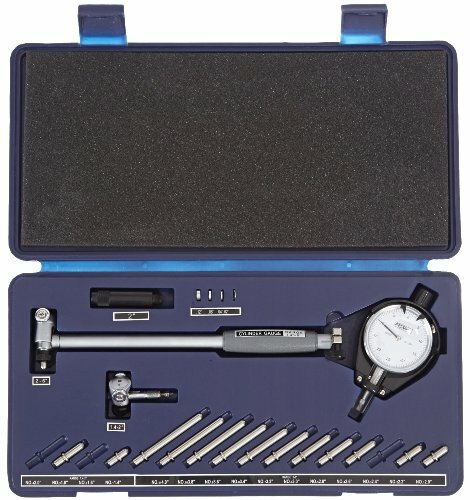 The way this works, is that you merely need to set the bore gauge in between the caliper's jaws, and then carefully wiggle it until you're able to receive the highest possible reading consistently. This will function as the baseline position for your dial for that exact caliper measurement- from there all you have to do is measure the actual bore and it will provide you the piston to wall clearance. 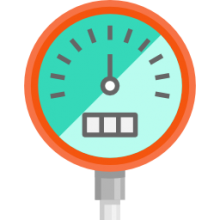 Another user writes of enjoying the gauge he purchased well over and above the old expendable gauges that he used to use that required caliper configuration for each measurement. Additionally, he writes that is easy and simple to check oval, taper, overall wear, in order to assess cylinders. 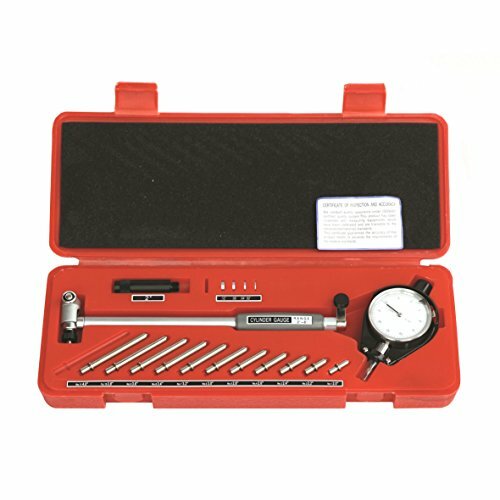 Some users write that it is essential to use an additional micrometer or dial caliper to configure the gauge correctly. If you're interested in purchasing a bore gauge, read our writeup here and check out the lively discussions over on Amazon. It's a great and under-rated way to understand whether a particular product is a right fit for you and your needs.